Professional photographers know the drill: every few years, Canon or Nikon announces a game-changing DSLR, often prompting top photogs to unload their complete kits and switch to another system in a never-ending attempt to shoot with the best. This time, Canon is first out of the gate, with its flagship EOS-1D X -- the latest in a series that dates back to 2001 with the EOS-1D. As you've probably noticed, the company's new top model looks virtually identical to its decade-old ancestor, but is otherwise a far cry from that four megapixel CCD sensor-sporting dinosaur. We've been anxiously awaiting an opportunity to check out Canon's new $6,800 18.1 megapixel full-frame model since first getting word of the beastly camera last week, and just had a chance to go hands-on during the company's Pro Solutions event in London. Jump past the break for our impressions and a video walkthrough. Though Canon's 1D series caters to the entire pro gamut, from sports and news photojournalists to wedding and commercial photographers, those two major demographics were previously split between a parallel set of bodies -- most recently the EOS-1D Mark IV, which offered high-speed shooting and catered to the former group, and the four-year-old EOS-1Ds Mark III, which packed a full-frame sensor and higher megapixel rating, appeasing commercial shooters who prefer higher-res images over high-speed shooting. The X replaces both models, however, providing enough power for both categories. Like the nearly identically-sized models that came before, the EOS-1D X is massive. If you haven't already gathered from the price tag, this isn't the camera for your next trip to the beach or even a casual African safari -- it's absolutely geared towards pros, who care far more about speed, accuracy and image quality than physical appearance and body size. The X feels very familiar, and since we've shot with every pro model that Canon's released since the 1D, we had no problem picking it up and firing off a few images without taking even a second to get accustomed. It feels heavy -- and does in fact have more heft than the models that came before it -- there's no question that your arm will get quite a workout during a full day of shooting. For photographers that demand quality, however, that trade-off is expected, and quite worthwhile. Canon says that it's still a few months out from allowing anyone to shoot and save images from its pre-production models, so we weren't able to walk away with samples, unfortunately. 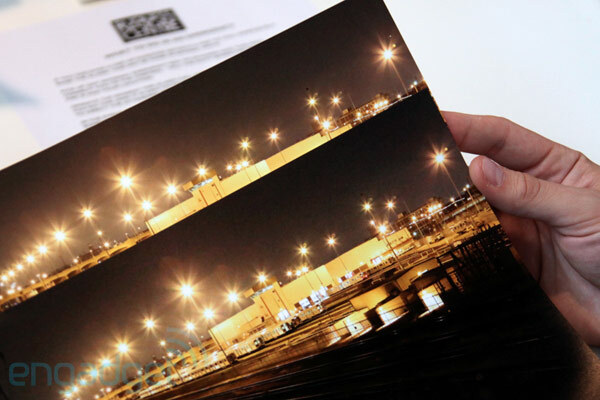 We did take a look at a printed shot at the top native ISO of 51,200, which looked quite crisp and clean, though there was a noticeable jump in noise from an identical frame shot at ISO 25,600. 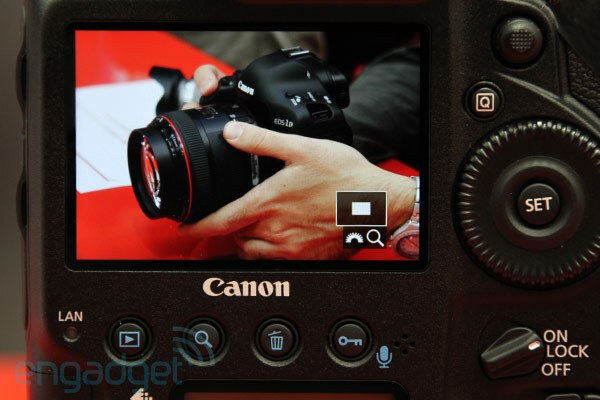 We did notice an element of noise with a grid-like pattern in the higher-sensitivity version, which isn't ideal, but the sample we saw had been shot with a pre-production model, so Canon still has some time to work out any kinks before these hit the assembly line. The top extended ISO is 204,000 (! ), which is a full stop higher than the 1D Mark IV -- the equivalent of jumping from f/4 to f/2.8, for example -- allowing you to get crisp images in very low light. Canon didn't have any images on hand shot at that sensitivity, however. The X may be virtually identical in size to every previous model in the 1D series, but its button layout has changed a bit. 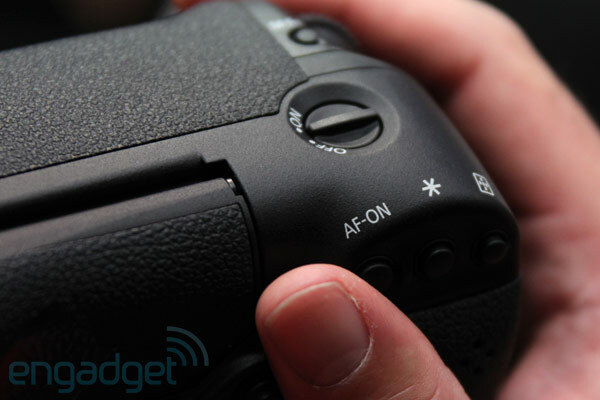 Canon has added dedicated controls at the bottom of the camera, enabling easy access to additional functions when holding it vertically. The system menu has also been completely redesigned, and is simpler to navigate, as you'll see in the gallery below. We're just as anxious to take home sample images as you are to see them, so we'll be reporting back just as soon as Canon gives us the green light to start shooting. The same goes for 1080 / 30p video -- no samples just yet, but there's no question that the X will be a popular choice among DSLR video shooters as well. Canon U.S. has estimated pricing at $6,800, but currency fluctuations could cause that sticker price to jump between now and the camera's expected March release. Sharif Sakr contributed to this report.